I am now walking abroad in the midst of My people, I live in the midst of My people. Today, those who bear genuine love toward Me, people like these are blessed; blessed are those who submit to Me, they will surely stay in My kingdom; blessed are those who know Me, they will surely wield power in My kingdom; blessed are those who seek after Me, they will surely escape from Satan’s bonds and enjoy blessing in Me; blessed are those who are able to forsake themselves, they will surely enter into My possession, and inherit My kingdom’s bounty. Those who run around for My sake I will remember, those who go to expense for My sake I will joyfully embrace, those who make offering to Me I will give enjoyments. Those who find enjoyment in My words I will bless; they will surely be the pillars that hold up the ridgepole in My kingdom, they will surely have matchless bounty in My house, and no one can compare with them. Have you ever accepted the blessings that you were given? Have you ever sought the promises that were made for you? You will surely, under the guidance of My light, break through the stranglehold of the forces of darkness. You will surely not, in the midst of darkness, lose the light guiding you. You will surely be the master of all creation. You will surely be an overcomer before Satan. You will surely, at the downfall of the kingdom of the great red dragon, stand up amid the myriad throngs to bear witness to My victory. You will surely be resolute and unwavering in the land of Sinim. Through the sufferings you endure, you will inherit the blessing that comes from Me, and will surely radiate My glory throughout the entire universe. 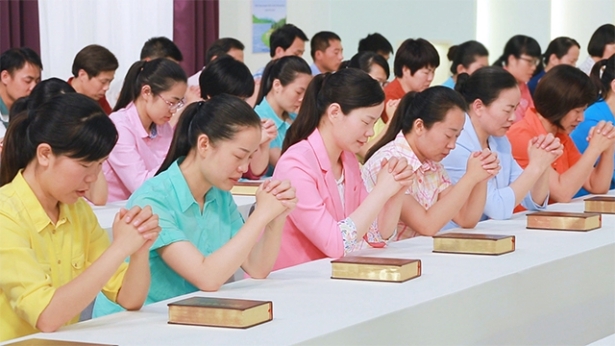 Because they are able to testify to God, and devote all their efforts to God’s work, those who truly love God can walk anywhere beneath the heavens without anyone daring to oppose them, and they can wield power on earth and rule all the people of God. These people have come together from across the world, they speak different languages and have different skin colors, but their existence has the same meaning, they all have a heart that loves God, they all bear the same testimony, and have the same resolve, and the same wish. Those who love God can walk freely throughout the world, those who testify to God can travel across the universe. These people are beloved by God, they are blessed by God, and they will forever live in His light. What I have prepared for you, that is, rare and precious treasures from all over the world, will all be given to you. You cannot conceive of nor can you imagine all of these at present, and no man has enjoyed this before. When these blessings come upon you, you will be ecstatic without end, but do not forget that these are all My power, My actions, My righteousness and even more so, My majesty. (I will be gracious to those whom I choose to be gracious to, and I will be merciful to those whom I choose to be merciful to.) At that time, you will have no parents, and there will be no blood relations. You are all people whom I love, My beloved sons. Nobody will dare to oppress you from then on. It will be time for you to grow into adults, and time for you to rule the nations with an iron rod! Who dares obstruct My beloved sons? Who dares attack My beloved sons? They shall all revere My beloved sons because the Father has been glorified. All the things that no one could ever imagine will appear before your eyes. They will be unlimited, inexhaustible, endless. Based on their different functions and testimonies, the overcomers within the kingdom will serve as priests or followers, and all those who are victorious amid tribulation will become the body of priests within the kingdom. The body of priests will be formed when the work of the gospel throughout the universe has come to an end. When that time comes, that which should be done by man will be the performance of his duty within the kingdom of God, and his living together with God within the kingdom. In the body of priests there will be chief priests and priests, and the remainder will be the sons and people of God. This is all determined by their testimonies to God during tribulation; they are not titles that are given at whim. Once man’s status has been established, the work of God will cease, for each is classed according to kind and returned to their original position, and this is the mark of the accomplishment of God’s work, this is the final outcome of the work of God and the practice of man, and is the crystallization of the visions of God’s work and the cooperation of man. In the end, man will find repose in the kingdom of God, and God, too, will return to His dwelling place to rest. This is the final outcome of 6,000 years of cooperation between God and man. Once the work of conquest has been completed, man will be brought into a beautiful world. This life will, of course, still be on earth, but it will be totally unlike man’s life today. It is the life that mankind will have after the whole of mankind has been conquered, it will be a new beginning for man on earth, and for mankind to have such a life will be proof that mankind has entered a new and beautiful realm. It will be the beginning of the life of man and God on earth. The premise of such a beautiful life must be that, after man has been purified and conquered, he submits before the Creator. And so, the work of conquest is the last stage of God’s work before mankind enters the wonderful destination. Such a life is man’s future life on earth, it is the most beautiful life on earth, the kind of life that man longs for, the kind that man has never before achieved in the history of the world. It is the final outcome of the 6,000 years of work of management, it is what mankind yearns for most, and it is also God’s promise to man. Living a normal human life on earth, man will be similar to an angel; though still being of the flesh, he will be much like an angel. This is the final promise, it is the last promise that is bestowed upon man. Previous：What are God’s people? What are the service-doers?